The ER8x5 Converter and Updater utility allows the firmware in an ER8x5 hardware unit to be changed from one mode to another. This process also updates the firmware to its latest implementation. Serial firmware (ES018): This serial protocol is implemented on USB and allows users to control the device using simple serial commands to set up the unit and to acquire data. It also provides the means for users to integrate the system into their own software environment eg National Instruments LabVIEW®. In addition, this firmware will recognise the C4D Configurator Software which allows the unit to be set up for operation.. Application firmware (ES017): This protocol provides the means for the hardware to be recognised and controlled by eDAQ software. Once the Application firmware is loaded into the hardware, it will be recognised by PowerChrom and Chart software. 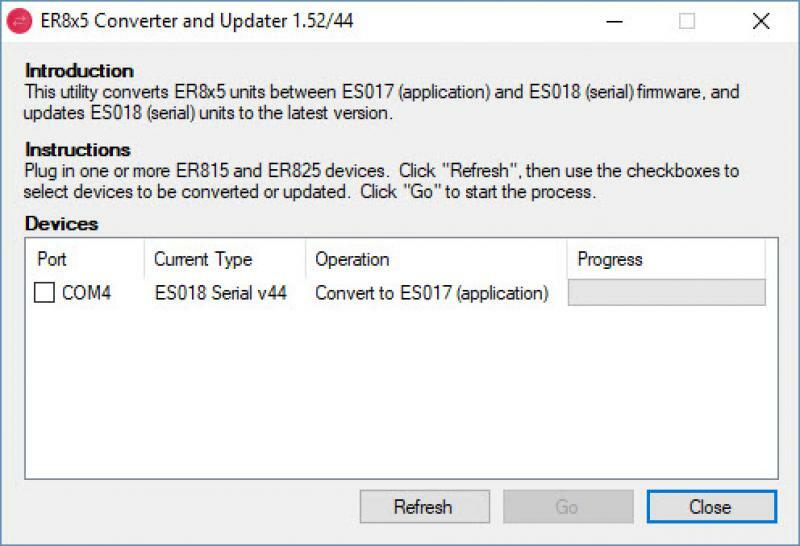 Download the ER8x5 Converter and Updater from the Utilities and Tools page. The procedure for using this software has been written up as a pdf manual.